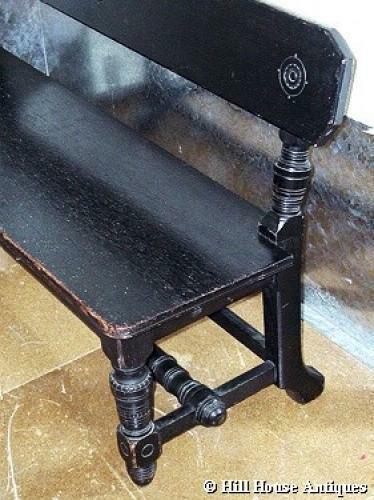 Arts & Crafts aesthetic movement/gothic revival ebonised oak hall bench/settle of compact proportions, and beautifully turned and carved front legs and central stretcher, by Lamb of Manchester (stamped to underside)- one of the top makers of their time - simple carved decoration possibly designed by by WJ Estall. Alfred Waterhouse also designed for them. Approx 48" wide, 16" deep and 28" high.